The Northern California Chapter of the International Palm Society is dedicated to the promotion and publication all aspects of palms and active research in the field of palms. Our Society is a diverse group of people including weekend gardeners, university researchers, species experts, people growing palms for the nursery business and just plain palm fans. The glue that holds our group together is our mutual admiration of palms. In order to demonstrate to the general public that a large variety of palms can grow outdoors in our area, the Society established a palm arboretum, or palmetum, at the Lakeside Park in Oakland, California. The over 80 varieties of palms selected for this planting are cool weather Mediterranean and high altitude tropical species and hybrids. This is the largest collection of its kind in the United States, and is a wonderful place to visit. The Society is also working on adopting The Mediterranean Garden area adjacent to our palmetum in order to grow palms and other plant species that do well in our area. It is a wonderful open space with contains the historic Easterbrook Bird Fountain as a focal point. The Society's Mediterranean Garden Project is in its infancy and, as more information arrives, will be discussed in detail in our web pages and newsletter. One of the society's goals is to advance the understanding of the palm species growing in Northern California. A database is being compiled to help in the identification of the various species that grow here, and help gardeners and landscapers pick palms that are appropriate for our local climate zones. 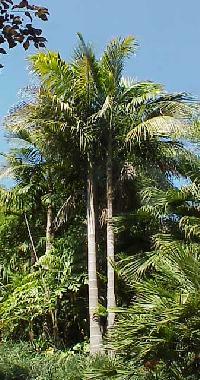 Palm articles highlighting species growing locally are also presented on this site. We hope you enjoy browsing our on-line pages and would like to hear from you regarding your interests in palms and gardening.